In the wake of Hurricane Sandy, the humble phone booth took on renewed importance as cut-off New Yorkers used pay phones to connect with each other in an emergency. Now, this quaint but reliable form of public technology is getting a major facelift. The platforms are run as a partnership between New York City and two companies, Cisco(s csco) and City 24/7. The smart screens were tested in a pilot project for a while but now they are officially live across the city, including at 12th & Broadway and 3rd Ave & 10th street. Soon, there will be 250 of the newfangled devices in all five city boroughs. “We’ll average a couple of installs per day. With the holidays approaching, they won’t all be in for a couple of months,” said City 24/7 by email. To understand the new program, it’s useful to recall how the business of old school pay phones works. In New York, 14 different companies rent pieces of sidewalk from the city to sell telephone calls and advertising. Like a hot dog stand, they have to abide by certain conditions and pay the city to set up shop — the New York Post reported this year that the city has 12,800 outdoor phones and earns $18 million a year from coins and ads. In the age of WiFi and smartphones, however, a coin-based telephone business is not a great use of city real estate. That’s why New York is turning traditional phone booths into a much broader form of communication that offers information about weather, transit, parks and more. And instead of coins, the smart screens make money through advertising — including coupons from nearby merchants. In practice, this means that a person strolling through Greenwich Village might tap on the public screen to find information about the subway or a city park. While there, she might also tap on the “deals” icon to bring up a list of coupons for nearby shops and restaurants. To store the information or coupons, she would hold up her phone and retrieve it via bluetooth, QR code or another mechanism. Maps and coffee coupons are just one dimension of the new platforms’ role. They will also, like traditional phone booths, serve as a communication tool during emergencies — but in a far more sophisticated way. In the event of another disaster like Hurricane Sandy, the screens will become two-way distress devices that let citizens call for help or receive instructions about how to find safety. As Jeff Frazier of Cisco explained in an interview, his company is providing back-end tools that integrate both the emergency 911 system and New York’s 311 public information service. All together, the city’s new smart screens represent a powerful fusion of data and communications that are intended to stay secure and online even during a disaster. As anyone who’s watched The Wire can attest, traditional phone booths have a dark side. They are not only a way to connect friends but also a place of business for pimps and drug dealers, and temporary shelters for hobos. And if New York’s new phone booths resemble giant iPads(s aapl), could they also be the target of vandalism or the wave of “i-crime” sweeping the city? In response to such concerns, Touchet says that the new platforms have been field tested for months and “not just in the Upper East Side.” He says they have been deployed successfully in high traffic areas like Penn Station and on the tough streets of Newark, New Jersey. According to Touchet, wherever the screens have been tested, they’ve been treated like a valuable public good by all communities. But he notes the screens were “over-engineered for a reason” and that they can withstand anything New Yorkers throw at them. The platforms can also be easily sprayed clean. Now that the machines are live, New York won’t immediately share in advertising revenue but will before long. The companies also plan to expand to other world cities in the future. There is more too it then just the physical part, the UI is what the writer is pointing to most likely, not the fact that it is a touch screen. So what if the electricity fall-out happens again? When the power is out and the so is the Internet. An old fashioned copper wire telephone will be most valuable. Remember Sandy? don’t new yorkers have cell phones? just wondering why spend so much on “ipad-like screens” when cp’s are abundant. Effecively,the articole leads You to believe that they will remove public pay phones. But the picture seems to be cristal clear. Phone + Interactive Touch Screen. Also consider this is a new way to increase local business in these rough economic times. It is also a quicker way to connect to local SOS services And get information out. Let’s not jump on and be critical. This is the direction cities are taking. Adaptation is The way to GO. The article is poorly written. The writer needs to make it explicitly clear if regular voice calls will still be available when these devices are installed. 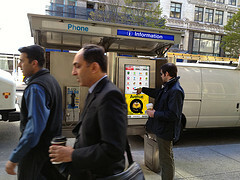 One of the photographs seems to show a traditional voice payphone next to the new device. Will this be the standard? These would be totally destroyed by vandals in Toronto. So drunk people can play with touch screens while they urinate in the booth. just make them wifi hotspots — that’ll do! “iPad like” What is this idiot smoking ? Good move by the Big Apple – I wonder if these screens have a hidden camera or two on them…? So the “fortress phones” are being taken out and replaced with DSL-connected touchscreen wifi kiosks. Do they still have pay phone capability? I hope there is still a physical keypad someplace, because I don’t want anyone writing down my calling card access number while I punch it into a big, illuminated virtual keypad. At least with a keypad I can cover up with my other hand and hopefully thwart thieves with binoculars. That looks nothing like an iPad. Unless you’re saying a rectangle screen with icons in a grid formation is “iPad-Like”. Are you an Apple lawyer? Wow, you have got to admit that is like pretty cool man! Soon to be defaced and destroyed. Sounds like a great use of money. How do you make a call?? “iPad-like screens” .. is this really necessary? The beginning of this article makes no sense. If pay phones were so helpful during a crisis why is the city now removing them for something that relies on power and can only direct you to “H&M”. The story seems to mean that pay phones are being taken away and useless advertising and other propaganda put in their place. So, if you lose your cell or it breaks, and need to make a phone call, you’re just out of luck. Well, at least it won’t steal your quarters. Why would you say Ipad like screens? They are simply touch screens. Thats kind of a ridiculous title, and misleading. Just evidence of Apple’s success. Even things that existed long before iPads are now called iPad-like. Good point. It’s one thing if someone totally non-tech savvy calls every touch screen as “iPad-like”. But it’s totally out of place and DUMB for a writer on a tech blog to say this. What do you mean iPad Like screens. Either they are iPad screens or they are just touch screens.. Don’t twist things.. He is correct. IPad has nothing to do here. Morons. Yeah, touchscreen kiosks have been around long before iPad.